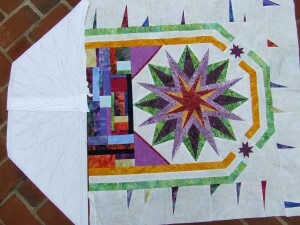 For the month of May in my Free Form Robin, I’m working on Bernie‘s quilt. Unlike Thea’s quilt in April, when I really struggled to find some inspiration for my addition (never fear, I’m really happy with how it turned out), I had ideas about this one before I even had it in my hands. I had seen photos of it in our Flickr group and had already begun thinking about what I could add. This is how the project looked when it arrived at my door. I wanted to mimic that horseshoe shape across the entire end of the piece, but face it in the opposite direction from the one that is already there. 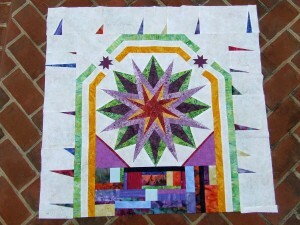 And I wanted to incorporate something similar to that pieces star that Bernie used for her starter piece. And here is where things get tricky. If your eyes start to glaze over when I talk about geometry, just skip down past the next photo! The original piece is an octagon, and thus the angles are 135°. However, because of the way the additions were incorporated beyond the original octagon, it made the most sense to add a piece that had just 3 sides (rather than the 4 that would be 1/2 of the octagon). This meant that the center point of my addition was not an equal distance from all the edges. In order to fill the space in a manner that makes the points look cohesive, each point had to be individually measured and drawn. Phew! I started by drawing one half of my shape. 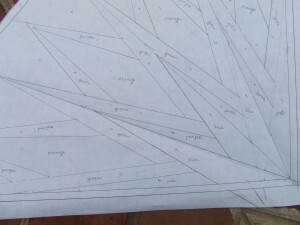 When I paper piece this, I will cut this portion into four segments. I’ve already pulled fabric and labeled where each will go. It like the quilting version of color-by-number but with fabric instead of colors! The other side mirrors the first. It was easier to do this than to individually draw each of the points on the other side. I taped my original drawing to a window, face down, and then taped another pieces of freezer paper on top and traced. Here is the quilt with my paper addition. I know it’s tough to picture without the colors, but the whole quilt will look something like this when my addition is complete. These are the fabrics I’m planning to use. 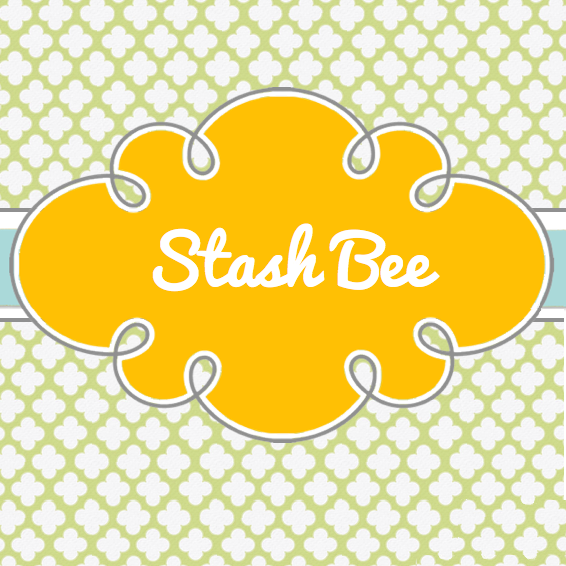 The background is Kona Ash, which is a very light gray. Bernie had included some of her original white-on-white batik with the quilt, but it was put to good use in the previous addition, and I didn’t think there would be enough left for my purposes. A solid white was too much of a start contrast, so I settled on this gray. The others are all batiks to keep with the original fabrics, as well as the additions. The green and yellow were included from the addition of the first horseshoe border and the others are mine that I already had. I’m really looking forward to completing this. 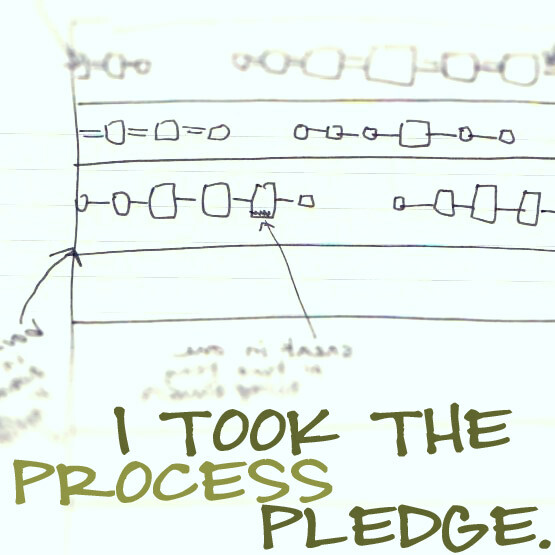 Also, since I’ve already posted several times about the process I go through when creating, I decided it’s high time I take the process pledge! I, Em, at Sewing by Moonlight, pledge to talk more about my processes, even when I can’t quite put them in the in words or be sure I’m being totally clear. I’m going to put my thinking and my gut feelings out there. I can’t believe you’re doing that kind of paper piecing already!